MELBOURNE BEACH, Florida -- After nearly five months of care at SeaWorld Orlando, an adult male dolphin was returned to Brevard County waters today near Melbourne Beach, Florida. 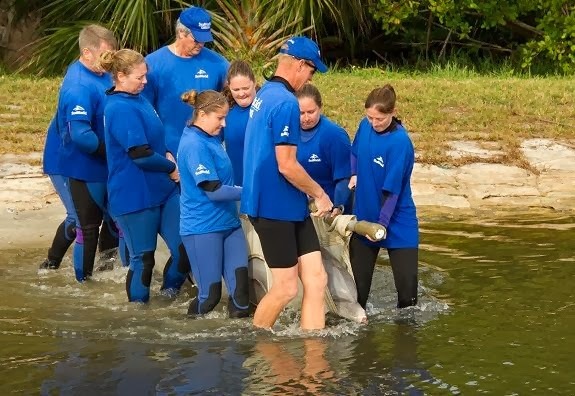 SeaWorld’s Animal Rescue Team, working closely with researchers and dolphin experts from Hubbs-SeaWorld Research Institute Florida (HSWRI), was able to successfully reintroduce the dolphin to the Indian River Lagoon. 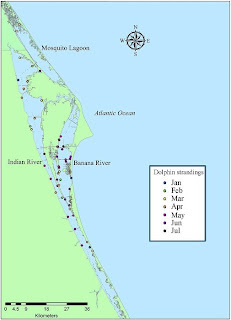 On June 13, 2013, the dolphin was found to be stranded in shallow waters of the Merritt Island National Wildlife Refuge. Hubbs-SeaWorld Research Institute’s research scientists were the first responder to the dolphin and SeaWorld Orlando’s Animal Rescue Team quickly rescued and transported the dolphin to the park’s marine mammal rehabilitation facility. At the time of rescue, the dolphin was considered to be in critical condition and appeared thin, weighing only about 350 pounds. He was also suffering from a respiratory disease. Blood and other fluid samples were taken, and medical treatment was administered. Over the past several months, the team has continued to provide the dolphin with around-the-clock supportive and rehabilitative care, including chest x-rays and medical treatment for his respiratory disease. During his time at the park’s marine mammal rehabilitation facility, the team made as little direct contact with the animal as possible to prevent him from becoming accustomed and dependent on humans. This was done purposefully in hopes that he would be reintroduced to the wild. During his rehab, the dolphin gained 140 pounds and his respiratory disease cleared. After a final health assessment on November 9, the National Oceanic and Atmospheric Administration (NOAA) authorized today’s return. Prior to today’s return, a high-frequency radio tag was attached to the dolphin’s dorsal fin by HSWRI research scientists. The tag, which has been designed to fall off in two to three months, will allow the team to monitor his movement, giving insight to his feeding and migratory patterns, ensuring he has acclimated well. The dolphin’s dorsal also was marked with “R08,” which will help in future identification once the tag has fallen off. Hubbs-SeaWorld Research Institute (HSWRI) has been involved with marine mammal strandings in Florida for nearly two decades and has been a participant in the Southeastern U.S. Stranding Network for over ten years. As a stranding network member, HSWRI responds to cetacean (whale and dolphin) strandings along the east coast of Florida providing an opportunity for HSWRI scientists to gather biological information and conduct valuable scientific research that is critical to our understanding of the health of coastal and ocean ecosystems in Florida. 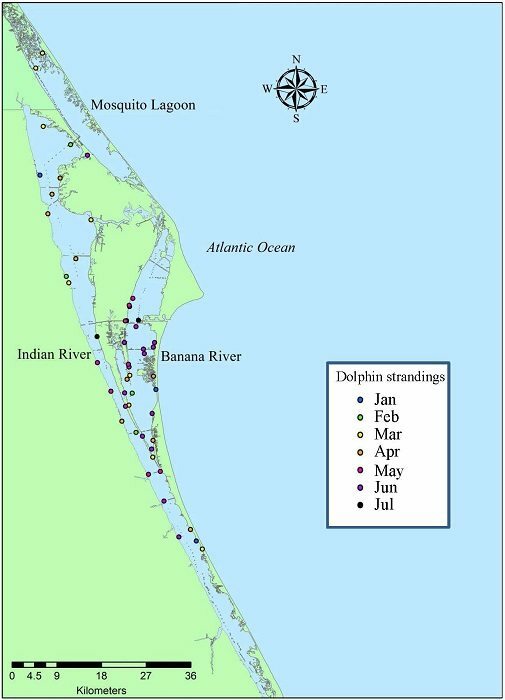 Most recently, research scientist Wendy Noke Durden was asked to provide leadership as local coordinator for the bottlenose dolphin Unusual Mortality Event (UME) in the Indian River Lagoon. If you see injured marine animals, you can help by calling the FWC hotline at 1(888) 404-3922 or by dialing *FWC on a cellular device.